MEXIQUE – Izapa - A monolithic sculpture representing a jaguar lying down, weighing about a ton was discovered recently in the pre Hispanic site of Izapa, in the Soconusco region of Chiapas. The engraved sculpture, estimated to be about 2,000 years old, was found in a riverbed and because of its weight it was not taken out immediately, but until a few days ago. 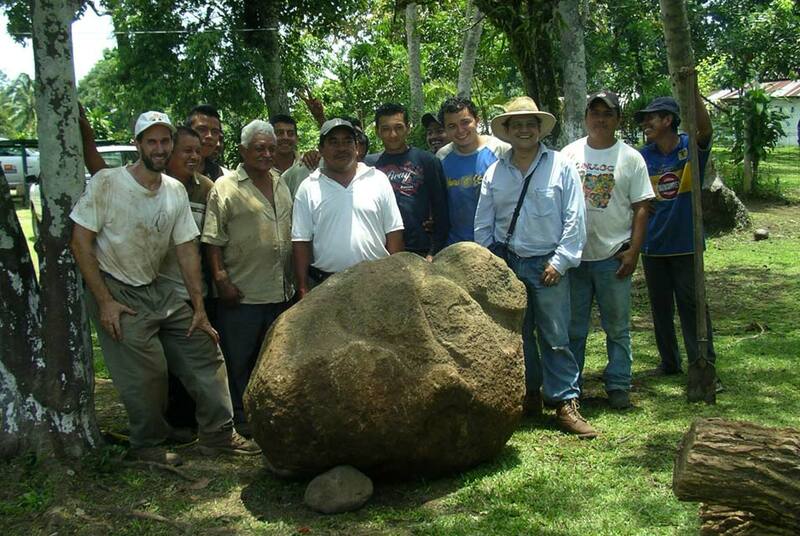 The maneuvers –made by the National Institute of Anthropology and History (INAH – Conaculta)– needed to rescue the piece required more than seven hours. This is the 91st sculpture registered in the archaeological zone of Izapa, one of the pre Hispanic sites in Chiapas that holds the most quantity of discovered monuments –284 up to now–, between which are sculptures, altars, thrones and steles. Some of these monoliths are plain and others have engravings that have been classified by experts as extraordinary by the quantity of strokes and their iconographic richness. Captured in Izapa’s monuments is the world view of the people that built this city approximately 2,500 – 2,000 years ago, possibly of mixe-zoque relations, predecessors to Mayan culture; some images refer to diverse myths that are narrated in the Popol Vuh, the sacred book of the Mayans. The new monument is 1.38 meters large (4.53 feet) by 87 centimeters (2.8 feet) tall and 52 centimeters (1.7 feet) wide, “only one of his faces is engraved with the features of a jaguar, with both the front and back legs bent as if it were lying down”. ROYAUME UNI – Stracathro - Directors of The Roman Gask Project, Dr David Woolliscroft and Dr Birgitta Hoffmann, are at the ancient site near Stracathro, which was part of a line of Scottish watchtowers believed to be the oldest Roman frontier. Despite being discovered from the air almost 50 years ago, little is known about the structure of the fort near Brechin, which makes up part of the Gask Ridge frontier system. Assisted by volunteers from Liverpool University, the experts will use non-invasive survey techniques such as magnetometry and geophysics to ascertain what is under the ground, without causing damage. As well as examining the fort, the project will also survey the adjacent Roman marching camp, believed to have been constructed as part of the military campaigns of the invading forces. The camp is famed in the archaeological world for its unusual gate structure, examples of which are only found in Scotland. 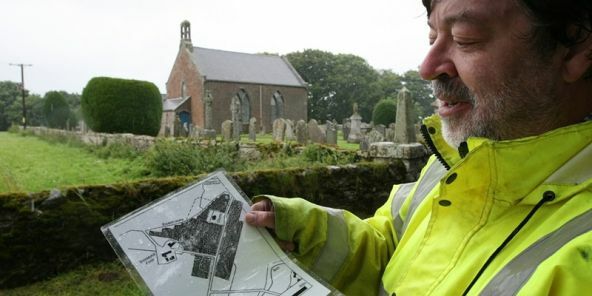 In addition to surveying the Roman occupation of the site, the team will also be looking for evidence of an early Christian church which was constructed after the Roman period, before being replaced by an 18th-century structure. The original church site played a crucial role in Scottish history, being the place where John Balliol — who later became notorious as the puppet king of Edward I of England — surrendered the Scottish crown in 1296. ROYAUME UNI – – Orkney - A third 5,000-year-old hand-carved figurine has been discovered during excavations on Orkney. Archaeologists had previously unearthed two ancient figurines in 2009 and 2010 at the dig at Links of Noltland in Westray. All three will go on display at the Westray Heritage Centre. Alasdair McVicar, chair of the Westray Heritage Trust, said: "The discovery of these figurines has really put Westray and the heritage centre on the map." 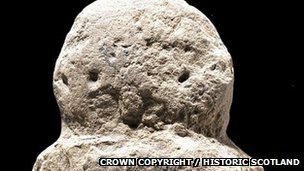 Culture Secretary Fiona Hyslop said: "There was understandable excitement when the first figurine, believed to be the earliest artistic representation of the human form ever found in the UK, was found in 2009. "To now be able to say that two more examples have been uncovered is unprecedented." ROYAUME UNI – Segedunum fort - The story of the rescue of a Roman fort hidden beneath terraces of homes is to be told in a new exhibition. When Victorian streets were cleared near Swan Hunter’s shipyard in Wallsend in North Tyneside in the 1970s, archaeologists carried out a trial dig. It was thought that any traces of Segedunum fort would have been lost due to centuries of previous development. But what the sample dig found was enough for plans to develop the cleared site to be scrapped. There followed nine years of annual excavations from 1975. During the nine years of digging, a complete plan of the base was recovered and made Segedunum the most excavated fort along Hadrian’s Wall, with surviving foundations of many buildings and part of the Wall itself. Geoff Woodward, manager of North and South Tyneside Museums, said: “The unearthing of the fort of Segedunum was a landmark event for Hadrian’s Wall. USA – Yarmouth Port - Volunteers led by a professional archaeologist in September will follow up on historic findings from a dig at Taylor-Bray Farm in Yarmouth Port last year. They will investigate four specific areas in hopes of finding the site’s first 1640s farmhouse and prehistoric Native American campsites. At the site, Jack Duggan and Marty Murphy of the Taylor-Bray Farm Preservation Association, pointed out a small patch of grass greener than the surrounding grass just off the entrance road to the farm that was the clue there might be a cellar hole or foundation underneath. Chartiers had indicated that a foundation holds in more moisture, resulting in the green grass, they said. “We hope to find the cellar hole and maybe a hearth,” Duggan said. Chartiers also said some old timbers in the newer farmhouse that was the focus of the last dig dated to the 1640s. “We think they took the old timbers for the new house,” he said. The three other sites that will be investigated in the upcoming dig are in two outlying pastures for the farm’s current animals where it is believed Native Americans had seasonal home sites, Chartiers said. Last year, he identified postholes in the dirt from the saplings the Native Americans would have used to hold up their homes called wetus. “We know enough from last year based on found stone tools and pottery in two sites and evidence of cooking fires,” Duggan said. The association members now believe a group of Native Americans had a seasonal encampment on the current farm pastures to take advantage of the nearby creek and access to Cape Cod Bay, but they are not sure when. It could have been from 500 to 3,500 years ago, Duggan said. SUISSE – Genève - A Genève, le chantier de réaménagement de l'esplanade Saint-Antoine est actuellement en suspens. Le lieu renferme dans son sous-sol d'importants vestiges archéologiques, dont des sépultures, et les travaux ne reprendront qu'une fois les fouilles terminées. «Il s'agit d'une découverte exceptionnelle», s'est enthousiasmé mardi devant la presse Jean Terrier, archéologue cantonal. La zone concernées se situe à la frontière entre la ville ancienne et la ville nouvelle, sur le front des fortifications érigé au 14e siècle. Ces vestiges sont extrêmement intéressants, a poursuivi M. Terrier. Les archéologues pensent notamment avoir découvert les restes de l'ancienne église de Saint-Laurent, datant du 6e ou 7e siècle et mentionnée dans des textes au 12e siècle. L'édifice sera détruit vers les années 1530 pour les besoins de la défense de la ville. De nombreuses tombes ont également été mises à jour, dont les plus anciennes datent du 6e siècle. Certaines dépouilles, déposées en pleine terre, ont également été exhumées. Selon les spécialistes, il s'agit probablement de victimes de la peste, enterrées à l'époque sur les éléments défensifs, à l'écart de la cité.